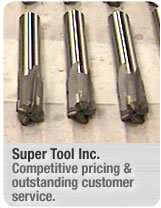 Super Tool has a long tradition of manufacturing high quality precision cutting tools and at the same time offering competitive pricing, delivery, and outstanding customer service. These are the cornerstones under which Super Tool was founded and the cornerstones that will be its foundation in the future. We remain the leading American machine tool and cutting tools manufacturer. We are currently looking for cutting tool distributors and dealers within the USA. Applicant must be an actual machine tool distributor. Must complete a Super Tool credit application (available online). Applicant must be approved by Super Tool. Click here to download a credit application. Once completed, please fax it to: 941-756-6480. Help us remain the leading machine tool manufacturer and the supplier of choice to the great American industrial machine. We look forward to reviewing your machine tool distributor application today. This page: Machine tool distributors and dealers wanted for American cutting tools manufacturer/supplier Super Tool Inc. USA.